Home › Architectural Research › Your Southern Grandparents Loved Their Ranch Homes! Your Southern Grandparents Loved Their Ranch Homes! 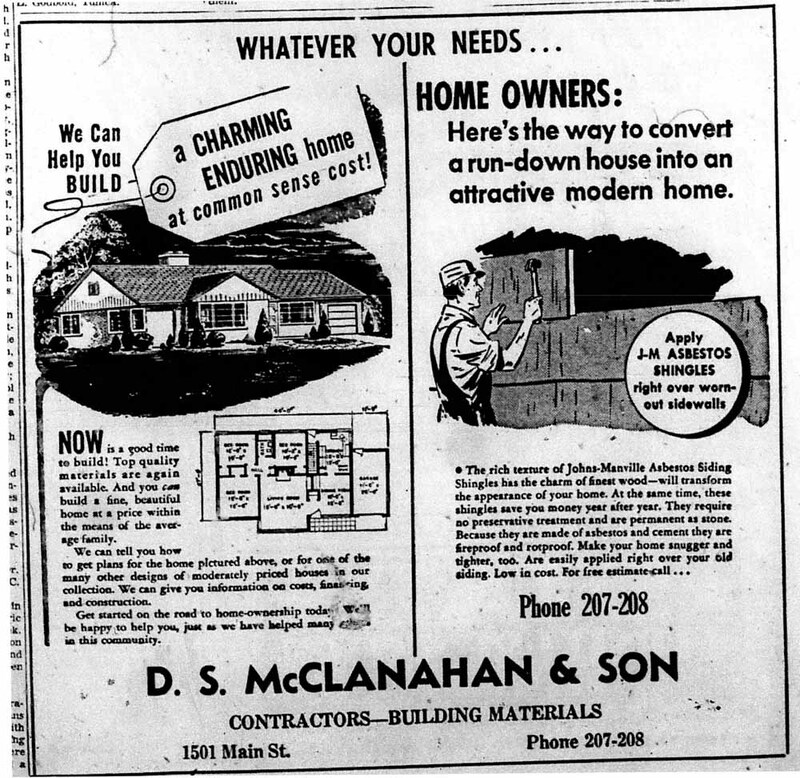 A few weeks ago, I was flipping through some microfilm copies of the Commercial Dispatch from the 1950s, and I came across this interesting article about the state of residential real estate in the South. 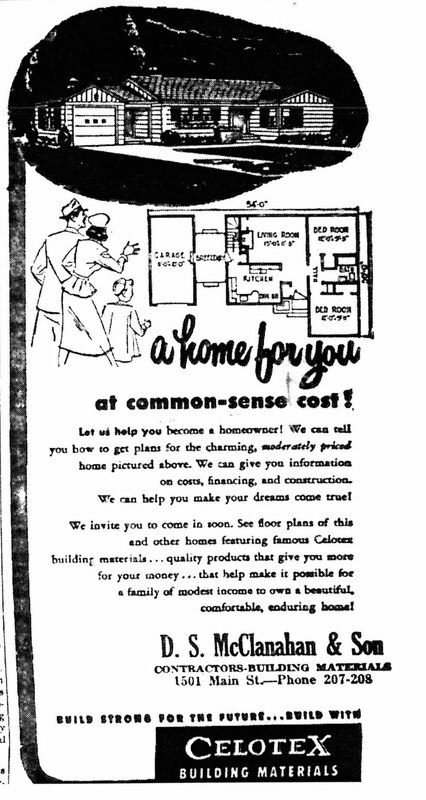 Although it’s meant as a little fluff piece to sell new homes to housewives, it has some insightful observations about the post-WWII rejection of the stereotypical Southern home with a big porch in favor of brick Ranch homes with “at least one pine-panelled room.” In this same period of newspapers, I also copied off some eye-catching advertisements for the Columbus construction firm D.S. McClanahan & Son that provide good visuals demonstrating the very trends that the article references. Coincidence? or clever marketing? ATLANTA (INS)–The antebellum Southern plantation house, with its wide verandah and impressive pillars, is no longer the “dream home” of the South. The average Southern home buyer today is looking for a ranch-style house, built of brick, containing at least one pine-panelled room, and in the medium-price range. Sam Brannan, Atlanta realtor, says there have been other changes; for instance, most Southern families are now putting the porch in the back of the house for greater privacy. The porches generally are screened. 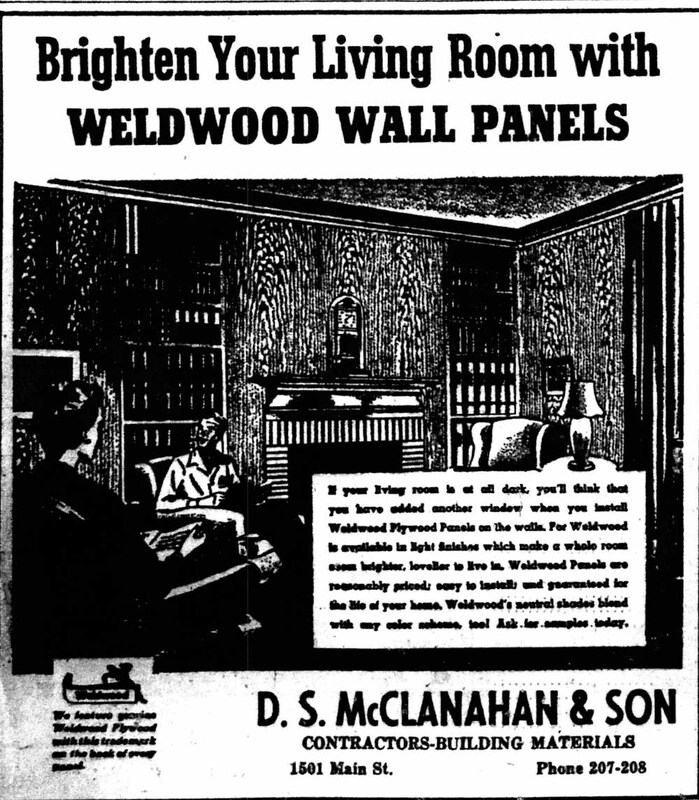 Pine panelling is very popular. Brannan says it has even invaded the kitchen in many cases, and most of the modern ranch homes have numerous natural finish knotty pine cabinets in the kitchen. About 50 per cent, he added, are using natural finish woodwork throughout the house, in addition to a pine panelled den or bedroom and a kitchen done in knotty pine. Brick of all types is being used. Most popular, though more expensive than the other types, is the used or “antique” brick, recovered from other buildings. 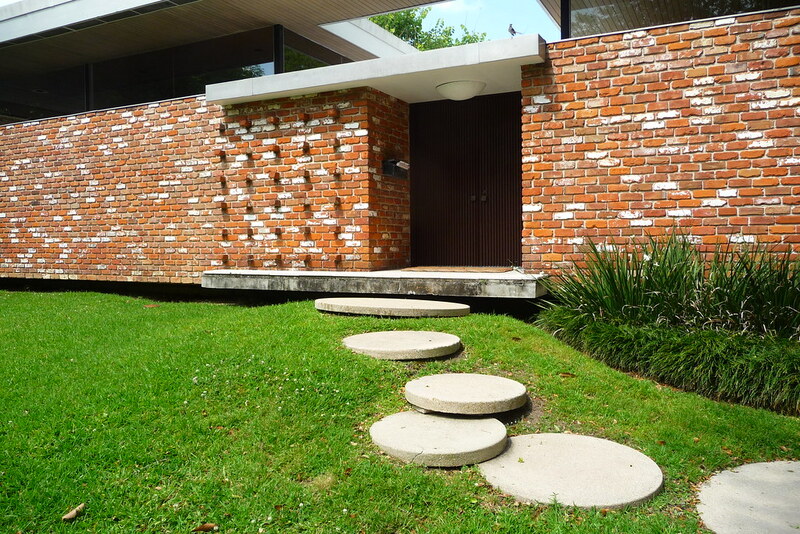 Brannan says that the rustic effect given by the used brick is much in demand. Most of the homes are of red brick, but other popular types are tri-colored and sand-colored brick. Carports are a fairly new, but widely accepted, idea in the South. The realtor says that almost all new homes are built with carports, and very few have garages. Basements too, are on the way out. Utility rooms now are built beside the carports, and central heating plants are run horizontally and attached to the floor joists. Outdoor living is more popular than ever before. The trend is toward terraces, patios and barbeque pits with the new homes. Margaret Reisman, Atlanta interior decorator, says that color trends are away from the dark colors generally associated with Early American decoration and toward lighter, dull shades of the same tones. Particularly popular, she pointed out, are shades of green, gray, beige, and brown. Nice post, E.L. You could write a book . . .
Ranch-style houses with low ceilings, compared to older-fashioned southern cottages, only work with air-conditioning. In my experience, in a house with 8 or 9 ft ceilings, your head is up in the hot air zone on a hot day unless the air is being constantly moved. But the article only mentions central heat planting plants. Did the typical suburban 1950s house have central air conditioning? Conversations with Jacksonians who grew up in ranch houses and experience with a 1950 Minimal Traditional house of my own indicates that these houses didn’t have A/C originally. They did have, almost universally as far as I can tell, have attic fans that, at least anecdotally (from the recollection of people who were children at the time), did a great job of venting the house in the evening and bringing in the cooler outside air. But I haven’t actually seen a house that still has its attic fan, so I’m not sure I believe they did such a great job since they were replaced as soon as people could afford A/C. When we moved into our house in the late 1990s, it still had its attic fan cut in the ceiling, but there was no attic fan, just two window A/Cs. From what I have been told about my maternal grandparents’ house, constructed in 1956, it always had a window air conditioning unit. The house did not receive a central air conditioning unit until after 1980. That house never had an attic fan, though it does have some of those classic round attic vents (one of which I had to repair after a storm to get it back to its spinning ways). However, attic fans lasted longer in more northern areas. I know of some family acquaintances in the Maryland suburbs of Washington, D.C. who kept their attic fan well into the 1980s. D.C. gets quite warm in the summer, just slightly less so than Mississippi, but that early 1950s house was kept very comfortable with only the attic fan and open windows. The attic fan did have a drawback: the risk of sudden, dramatic limb amputation. As the fan drew air from the cool, finished basement to the attic, it could build up quite a high amount of pressure. When there was a pressure differential outside due to changes in wind, etc., then the solid-wood doors would slam shut. Everyone who lived in that house (and those who visited it enough), knew never to stand in a doorway. Eventually, I believe the owners installed doorstops anchored to the baseboards (similar in function to exterior shutter dogs) to hold the doors firmly. Growing up in a house that was built in 1937 we did not have an attic fan, but the original central plant in the basement had a blower that would draw cool air. My neighbors house built in 1939 did have an attic fan that as kids we loved to turn on due to the squealing the belt would make upon start up. This unit also had a rheostat for the variable speed motor. I haven’t seen many of that type in residential construction. Love this article! Not a subject I’ve researched before. With heating installed, but few A/Cs, what was the motivation for lowering ceilings to 8′ in the ranch-style houses? Motivations for low ceilings are the 8′ dimensional stud and periods of financial constraints & rationing in the early 20th century. Beginning in the 1930s through the 1960s FHA backed loans exerted financial controls that mandated smaller houses that met a minimum standard. These tax payer backed loans were designed to give a family a reasonable place to live, so anything beyond necessary was frowned upon. Thank you! Many have heirlooms too large for small rooms and 8′ ceilings. I’ve always lived in old houses with high ceilings untilI moved into my 1960s Ranch 12 years ago. I feel claustrophobic with the low ceilings and small rooms, even after all of this time. I can only imagine what it was like for those making the initial transition. This article is giving me a new perspective though. I had assumed the 8 foot ceilings were a result of the 4×8′ sheetrock panels, but is it the other way around? Or was it a big cabal meeting in a smoke-filled room deciding to ruin the South? The other way around. Early gypsum panels varied in size. Some were close to square 32″x 36″ while others were 16″ x 48″. But it’s a good question as to when the 4’x8′ sheet appears. Of that I am not sure. From what I’ve seen advertised in period news papers at the beginning of the 1950’s it was considered a luxury, but by the end of the decade it was becoming more common. Malvaney is spot on about the prevalence of attic fans. These units appear in advertisements in the late 1930s and begin to fade from the norm for new construction in the late 1950s. Maybe a post on attic fans is in order? The ranch burger took over the South in the 20th century much like kudzu. I always thought the appeal was extremely low maintenance. 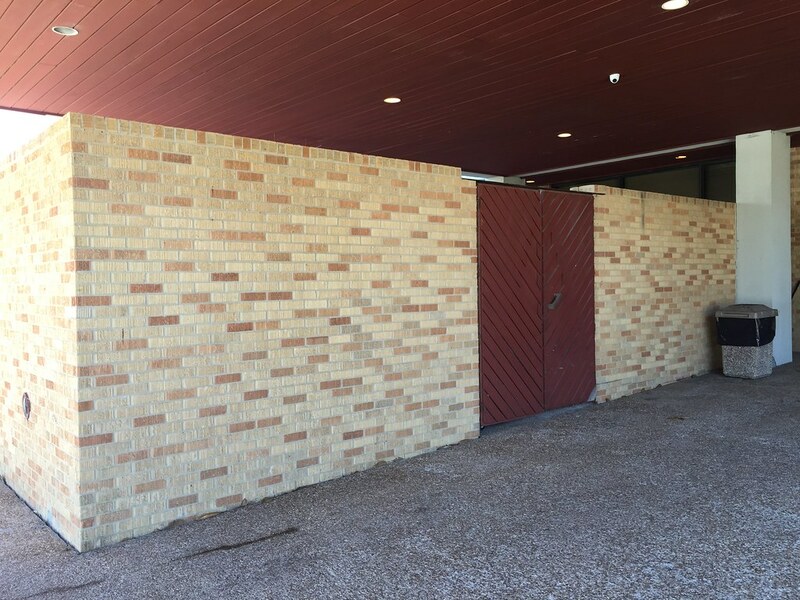 The brick veneers of the homes–the defining feature–is regrettable, always laid in garden bond, the only mode when the brick is merely veneer. Often it was orange. 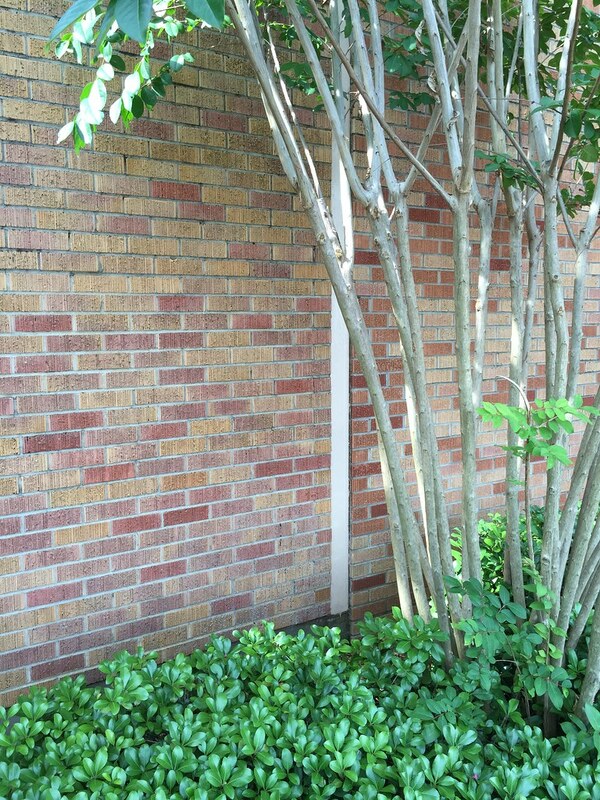 It all depends how the veneer is adhered, in true masonry construction a garden type or common bond is often the norm. If masonry ties or a stucco bed are the method of the veneer attachment running bond seems more prevalent. Every once in a while you’ve someone who would mix it up by using stack bond, or perhaps a roman brick that cause a stagger effect in the bond. Tri-color would be the use of a variety of brick colors on a single structure(Red, Orange, Tan, etc.) I’ll hunt my photo files. Surely I can find an example to share. This is an example of white, red and orange Tri-color. This is an example of buff, tan, and red Tri-color. This example of tri-color isn’t the greatest photo but it shows the example of variation of color in a single brick. Note that some of the individual brick in the photo are both tan to pink. Thanks for all those examples, Thomas! I’ve always called this “variegated brick” but now I know I’ll have to start calling it by its correct name, tricolor. But does that mean I have to count the colors? What if there are four? The last example i gave might not be a tri-color technically probably more than three colors. I think variegated is a very descriptive term, and can be more generally applied. Having tried to count the number of shades of bricks used on the old Pascagoula High School building A, I finally determined that only 18 shades variation were visible when spread across the wall. Octodec-color brick doesn’t roll off the tongue like Tri-Color does. It is difficult enough for a builder to get an owner to pick three colors, let alone any more. Wow, Octodec-color! It certainly sounds impressive and is guaranteed to make you seem knowledgeable! What a great post! If you can tell I’ve enjoyed all the comments. Before we moved into our centrally air conditioned suburban Jackson home in 1973, we lived in a modern tract house on McDowell Rd. We had an attic fan, but my parents’ bedroom had a window unit air conditioner. I remember it being just wonderful to sleep with only the attic fan and the windows open, but I think the heat isn’t so bad on children. My daughter is in Harbin, China, this summer, where, for this week, at least, the temperatures and humidity have been exactly the same as they are here in Mississippi. She is staying in an unair-conditioned dorm with only a wall-mounted fan for relief. Some Chinese, however, have a fear of fan-related death; her roommate is one such person so until the heat reached the upper 90s during the day, my daughter has had to suffer through the summer (it is the rainy season so the humidity was already quite high). For those unfamiliar with fan-related death, see: . Apparently, what is related in this article has variations so the Chinese roommate does not trust the fan even with the windows open. The link didn’t come through for some reason, so I googled “fan-related death.” Wikipedia calls it an urban myth: https://en.wikipedia.org/wiki/Fan_death. Ask a Korean goes into more detail: http://askakorean.blogspot.com/2009/01/fan-death-is-real.html. I do agree that having a fan blowing directly on your face makes breathing difficult, so, um, direct it away from your face? Whew, what an inconvenient belief to possess in hot, humid climes! increases thermal stress and health risks during EHE conditions. exhaust to the outside (box fans are best). Use a portable electric fan to bring in cooler air from the outside. doors open to the outside. the air around and keep you cool by helping to evaporate your sweat. can accelerate the risk of heat exhaustion. Haha! The fan in her dorm room is attached to the wall at a point too far for its cord to reach the nearest outlet; she had to purchase an extension cord to use it (she says that her teachers carry extension cords around as it is the same for the air conditioners in the classrooms). Enjoyed this post and the comments – truly a by gone era that is only missed in a nostalgic sense. My grandparents had cross ventilation and box fans in their semi-rural Mississippi home. My grandfather had installed an attic fan, but I never remember it running, My father related in later years that my grandfather didn’t run it because he could see (in his mind) the electric meter spinning wildly as it ran! Later my parents took them several window units that were installed and politely used when we were present. They were so used to not having air conditioning that they felt no need to run them otherwise. Why carports instead of garages? The cost to construct a carport was lower, but a carport was also away to show off a vehicle in an increasingly auto-centric culture. Additionally we don’t have to deal with the blowing snow they have in winters up north. Thank you! I love this blog! Everybody is so friendly and helpful!